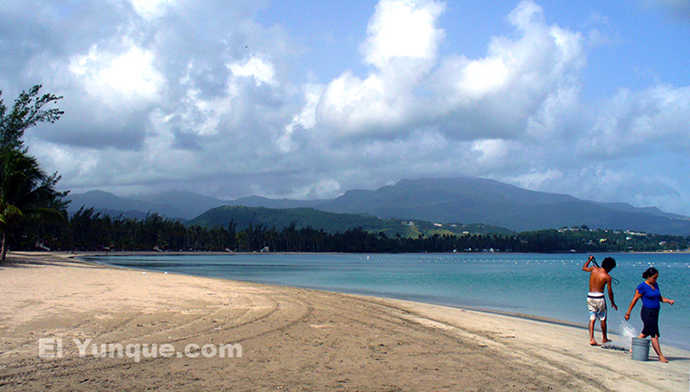 'Balneario Luquillo' has always been Puerto Rico's most famous beach. 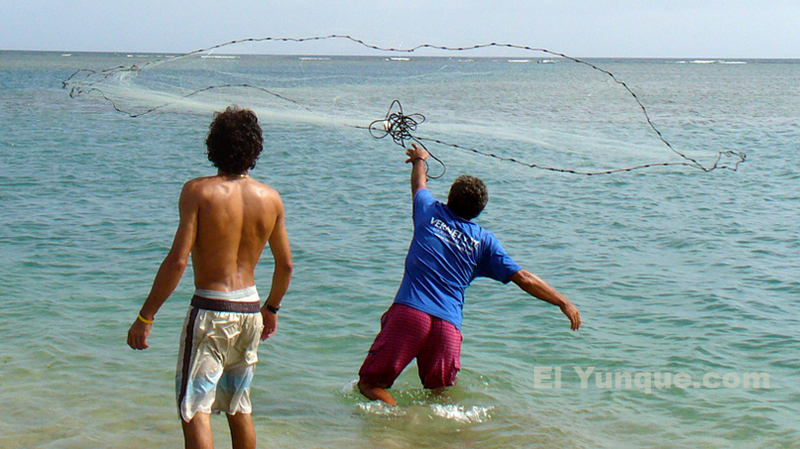 The town of Luquillo has several beautiful beaches; the point, 'the wall' ( La Pared) and Playa Azul beach. Each different. Campgrounds at the Balneario are lovely but only safe if there's a small crowd. This is an easy day trip from San Juan, or you can combine it with a trip to the El Yunque rainforest ( top of the mountain you see in the distance, above photo). The trick to enjoying this beautiful beach is to go on a weekday and in the morning. This photo was taken early on a summer morning before the crowds poured in. In the winter months the beach is practically deserted and looks like this all day. Summer weekends and holidays are chaos! Lunch at one of the many kiosks ( food kiosk on the left with your back to the ocean). . They offer local fried snacks, fancy meals, hamburgers, seviche etc. very varied. Carlos rents Kayaks behind the Kioskos. Another piece of advice. If it has been raining a LOT there is a river up current from Luquillo that dumps dirty water after a big rain. A better beach in the rainy season would be the Seven Seas Balneario. Seven Seas is always very clean, there are no rivers going into the bay. 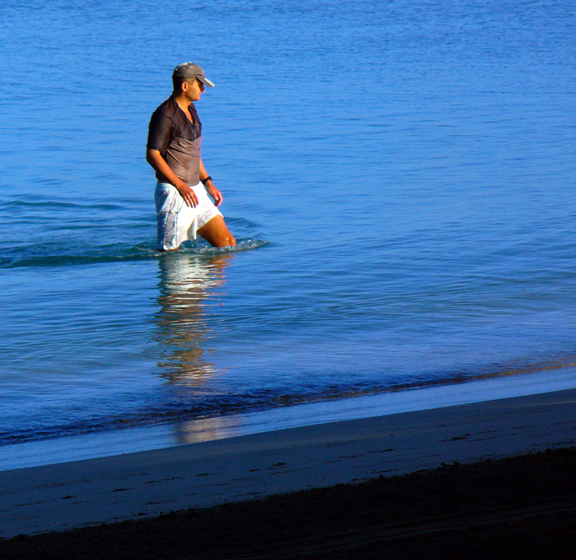 More beach information on the Puerto Rico beaches page. Getting to Luquillo: Leave San Juan, heading East, on either Hwy #26 or the scenic route road # 187. A. If you take the hwy pass the airport and continue on #26 until it becomes # 66 ( do not get off on any exit, simply stay on #26 until it turns into #66 which is a toll road, pay $1.50). Continue to the end of #66 when it turns into #3. then stay on #3 until Luquillo. B. Take the scenic road # 187 going past the Ritz Carlton Hotel and Balneario Isla Verde. 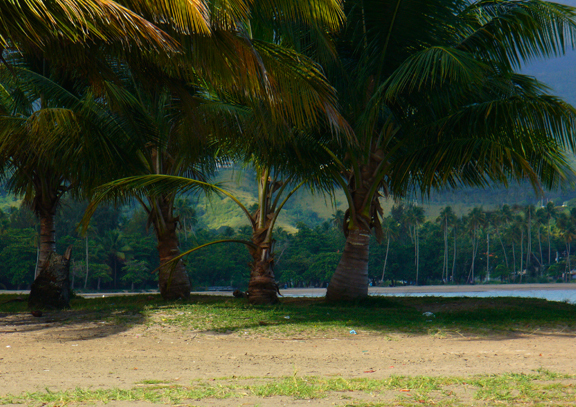 continue on this coastal beach road until you have crossed the large bridge over the Loiza River. If you stop on the way to admire the beach, or swim, make sure you are in a public area and there are other cars and people, as petty theft of car trunks is rampart in this area. After crossing the bridge drive another block and turn right at the big intersection with light. you then drive a few miles until you reach the Outlet Mall Intersection, where you turn left on #3 heading East. Just before reaching Fortuna and Luquillo you will pass the entrance to the El Yunque Rainforest.. There is a big intersection at which the rainforest is to the right and The Rio Mar Resort is to the left, keep going east on # 3. As soon as you can easily see the ocean on your left you are almost at the Balneario ( Public beach pictured on this page) and the town of Luquillo is just beyond ( turning left at the next big intersection with Walgreens on your right, you would enter the small town of Luquillo with its' varied beaches on the waterfront. Like every beach, Luquillo has many moods and many colors !